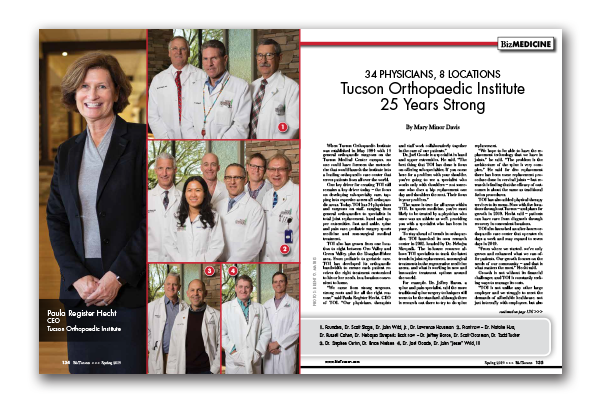 When Tucson Orthopaedic Institute was established in May 1994 with 14 general orthopaedic surgeons on the Tucson Medical Center campus, no one could have foreseen the meteoric rise that would launch the institute into a leading orthopaedic care center that serves patients from all over the world. One key driver for creating TOI still remains a key driver today – the focus on developing sub-specialty care, tapping into expertise across all orthopaedic areas. Today, TOI has 34 physicians and surgeons on staff, ranging from general orthopaedics to specialists in total joint replacement, hand and upper extremities, foot and ankle, spine and pain care, pediatric surgery, sports medicine and non-surgical medical treatment. 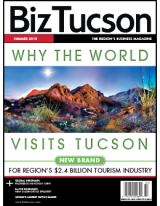 TOI also has grown from one location to eight between Oro Valley and Green Valley, plus the Douglas-Bisbee area. From pediatric to geriatric care, TOI has developed its orthopaedic bandwidth to ensure each patient receives the right treatment customized to his or her needs, in a location convenient to home. The same is true for all areas within TOI. In sports medicine, you’re most likely to be treated by a physician who once was an athlete as well, providing you with a specialist who has been in your place. To stay ahead of trends in orthopaedics, TOI launched its own research center in 2002, headed by Dr. Nebojsa Skrepnik. The in-house resource allows TOI specialists to track the latest trends in joint replacement, nonsurgical treatments in the regenerative medicine arena, and what is working in new and innovative treatment options around the world. For example, Dr. Jeffrey Baron, a spine and pain specialist, said the more traditional spine surgery techniques still seem to be the standard, although there is research out there to try to do spine replacement. “We hope to be able to have the replacement technology that we have in joints,” he said. “The problem is the architecture of the spine is very complex.” He said for disc replacement there has been some replacement procedure done in cervical joints – but research is finding that the efficacy of outcomes is about the same as traditional fusion procedures. TOI has also added physical therapy services to its menu. Now with five locations throughout Tucson – and plans for growth in 2019, Hecht said – patients can have care from diagnosis through recovery in convenient locations. TOI also launched an after-hours orthopaedic care center that operates six days a week and may expand to seven days in 2019. “From where we started, we’ve only grown and enhanced what we can offer patients. Our growth focuses on the needs of our community – and that is what matters the most,” Hecht said. Growth is not without its financial challenges, and TOI is constantly seeking ways to manage its costs. Goode said this is contingent upon the physicians being prudent in making decisions with patient care. “We as doctors have to do what’s right and necessary and not be conservative at the expense of our patients – while at the same time understand if we send a patient for an MRI, it may cost that patient $500 so we need to be prudent when making those decisions,” he said. Dr. Christopher Stephens, another TOI hand and upper extremity specialist, also sees managing healthcare costs as one of the greatest challenges in healthcare going forward. He is one of the few surgeons who does carpal tunnel procedures in the office, when appropriate, as opposed to the traditional hospital or surgery center setting. He said that reduces the overall cost of care. Across the board, the greatest challenge faced in orthopaedic care today is that the need for treatment far outweighs the number of specialists available to treat those needs. According to the Arthritis Foundation, osteoarthritis disease is the most common disease in adults – affecting 30.8 million people. It is fifth among all diseases in the world. It is the most prevalent of all musculo-skeletal pathologies in the world, affecting approximately 10 percent of the world’s population over the age of 60. It is the leading cause of degenerative breakdown in the joints. Given the aging population, the demand for orthopaedic care will outweigh the supply of specialists. According to a recent report by the American Academy of Orthopaedic Surgeons up to 2016, more orthopaedic surgeons are likely to specialize than they were in 2011 with 58 percent reporting specialization. This will help meet the growing demand, but other challenges remain in the shortage of “physician extenders,” said Dr. Lawrence Housman, one of TOI’s founders. “The use of physician extenders – physicians’ assistants, nurse practitioners and registered nurses – is growing. These are well-trained medical professionals that can serve patient expectations by seeing them faster, ordering tests and even making diagnoses,” he said. Along with these challenges moving forward, Hecht said there is also great opportunity as TOI continues to build its sub-specialty roster and focus on the quality of care they provide. More non-invasive procedures – including arthroscopy, robotics and regenerative medicine – continue to introduce new and innovative ways to treat patients, providing lower cost impact to the national healthcare system and excellent patient outcomes.